A lot of Vietnamese dishes are inspired by French cuisine, because Vietnam was a longtime colony of the French empire. Tomates farcies (cà chua nhồi thịt in Vietnamese) is no exception. In Vietnam, it is referred to as cà tomates farcies, which literally translates to "stuffed tomatoes tomatoes"! Traditional French stuffed tomatoes are filled with garlic bread crumbs, chair à saucisse and chopped jambon de Bayonne (sausage meat and prosciutto). 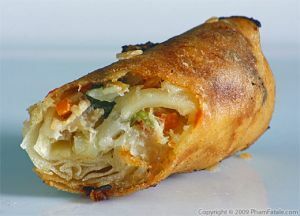 The Vietnamese version uses the same filling as meat eggrolls. 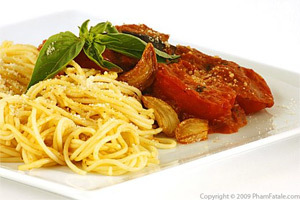 I used veal for its low fat content as well as its texture and color for this dish. And most important, it cooks pretty fast. You can certainly use any other meat, such as ground beef. Frying the garlic and shallot: In a saucepan, heat about 2 tablespoons of canola oil. Add a teaspoon of garlic and 1 shallot. Cook until slightly golden. Transfer to a bowl (don't drain). Let cool. Seasoning the meat: Place the ground veal in a large bowl. Add the golden garlic and shallot with oil, raw shallot, leek, green onion, cumin powder and red chili powder. Mix well. Season with salt and pepper. Cover with plastic wrap and refrigerate overnight. Prepping the tomatoes: Reserve 2 tomatoes. Halve the rest of the tomatoes horizontally. Remove and reserve the juice, seeds and flesh of the tomatoes in a bow. Leave the separating membrane in the inside though, as the meat will grip to the shape of the inside membrane while cooking. Sprinkle the inside with kosher salt. Layer a cooling rack on top of a baking sheet and place the tomato halves on top, flesh side down. Let them sit for 1/2 hour. Pat dry with kitchen towels. Prepping the bean thread noodles: Place the whole package of dried bean thread noodles in a bowl. Don't forget to cut the little cotton threads and discard them! Soak them in cold water for 20 minutes and drain. Chop into 1 inch threads. Set aside. Prepping the black mushrooms: Soak the black fungus mushrooms in boiling water for 2-3 minutes then drain. Chop finely. Set aside. Finishing the meat seasoning: In the large bowl of ground veal mixture, add a tablespoon of parsley, bean thread noodles and black mushrooms. Sprinkle with mushroom powder. Mix well. Refrigerate the mixture until you're ready to stuff the tomatoes. Checking the seasoning: In a small pan, heat about 1 teaspoon of peanut oil. Add about 1 to 2 tablespoons of the veal mixture. Cook for about 3 minutes. Taste the meat. Season with more salt and pepper if necessary. Cooking the meat: Stuff the halved tomatoes with about 1 to 2 tablespoons of the veal mixture. In a large pan, heat some oil. Infuse the oil with the remaining garlic. Add the stuffed tomatoes, meat side down. Cook until the surface of the meat is nice and golden. Transfer all the tomatoes to a roasting pan. Bake for 40 minutes. Let cool completely then refrigerate overnight. Making the sauce: Chop the remaining 2 tomatoes. In a deep large pan, add some oil. Add the chopped yellow onion. Cook until it's golden. Season with salt and pepper. Add 2 tablespoons of parsley (stem included, because that's where the flavor is the most potent). Add the chopped tomatoes, the tomato paste and the reserved tomato pulp. Cook for about 10 minutes. Add the stuffed tomatoes, flesh side up. Cover and simmer for about 5-8 minutes. Serving time: Serve immediately. Garnish with some parsley. Accompany with steamed jasmine rice, a dipping sauce with fermented fish sauce base called nước mắm and some chili garlic sauce or Sriracha. I always make this dish two days ahead of time for two reasons; first, if we have a dinner party, it's a huge time saver and secondly, warming the dish one more time guarantees that the meat is fully cooked. If you don't have the time, you can make it all in the same day, but the meat will not be as flavorful. A good way to check if your filling is properly seasoned is to sauté some in a frying pan with a little oil so that you can taste it. If it's not quite seasoned enough, add more salt and pepper as needed to the mix. Once the tomatoes are stuffed, it's too late! If you're planning on serving this dish the same day, you might want to add 1 (6-ounce) can of lump crab meat. If you decide to store the stuffed tomatoes overnight, it would be better not to add crab to the meat mixture. Some people like to add about 8 ounces of water chestnuts, finely chopped to the filling for more crunch, but I prefer not to. I don't think they add any particular flavor to the filling. Any kind of tomatoes with firm flesh would work fine for this dish. If you use smaller sized tomatoes such as roma tomatoes, just cut the top off and use the entire tomato to stuff with meat. 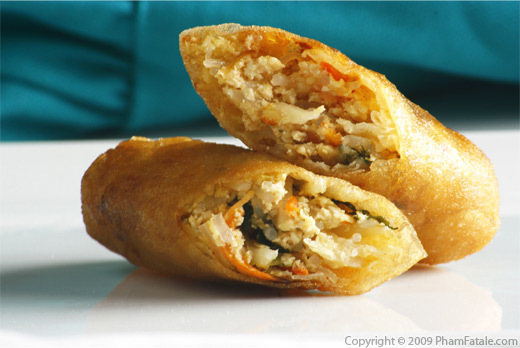 For a vegetarian version, you can substitute the filling with the same stuffing as the one used for veggie egg rolls. Published By: Jacqueline Pham on September 13, 2009. What divine filled & tasty looking tomatoes!! I so love your yummie flavours, Jackie! What a wonderful dish! I love stuffed tomatoes, and with egg roll filling, I bet they taste out of this world! 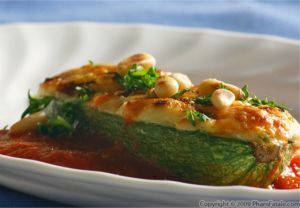 I love the veal filling - these look great!